Adding to their Square 43 and Box 21 folding speedlight softboxes, Gami Light of Malaysia have released a new collapsible speedlight snoot and an adjustable bounce card. Kuala Lumpur: Gami Light Concepts, the Malaysian manufacturer responsible for the recently released Square 43 and Box 21 folding softboxes, is to unveil another pair of speedlight modifiers. 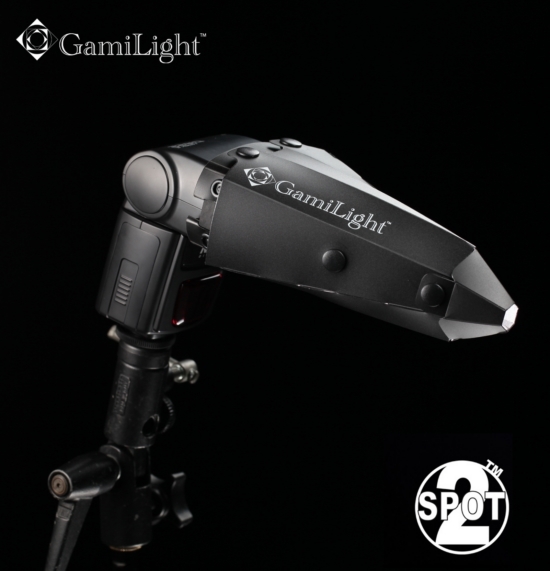 The Gami Light Spot 2 and Event Pro will be based on the same snap-on press-stud mounting system. The first new modifier is the Spot 2, a folding snoot making use of the existing press-stud-based Gami Light accessory mounting system. According to the company, the Spot 2 provides what they describe as a “full studio honeycomb effect” with a gradual falloff around the edges of the circle of light. An included snap-on “S adapter” allows the production of an spotlight twice as narrow as using the Spot 2 alone. The modifier weighs approximately 200 grams and measures 11cm * 8cm * 14.5cm (17.5cm with S adapter) when set up. The retail price of the Spot 2 is US$24.99. 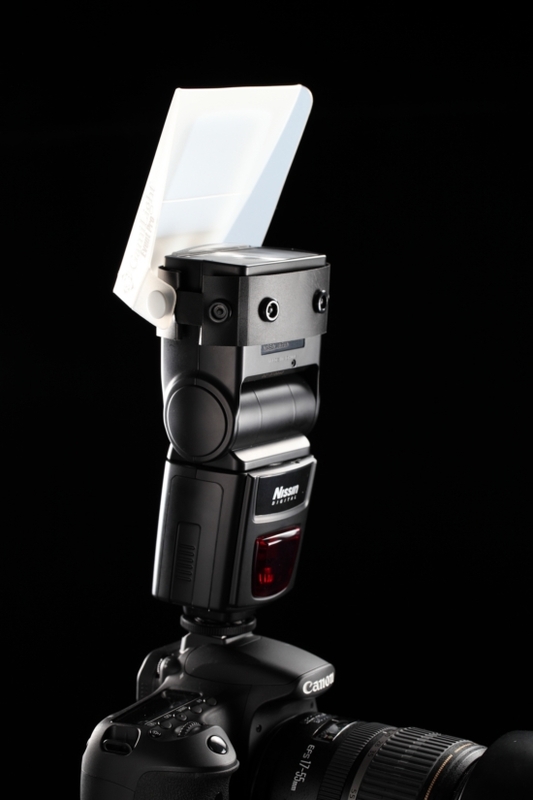 The Gami Light Event Pro is a bounce card that, by strategic repositioning of the mounting press-studs, unfolds into a “mini softbox” type diffuser for events photography. In the latter mode (above) a hole in the top allows the use of ceiling bounce flash, and the whole modifier can be flipped out of the way to facilitate direct flash when needed. 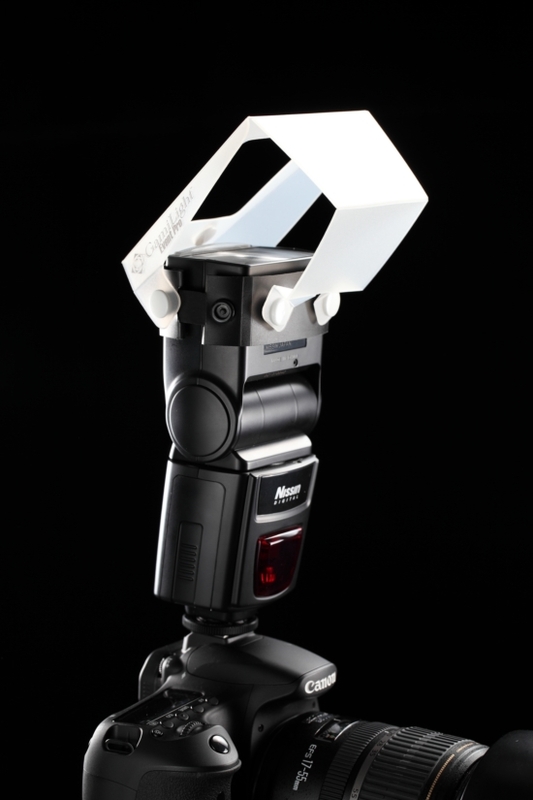 The Event Pro can be positioned in a range of angles on the flash head, as well as being mounted sideways. The bounce card position is shown below. The Event Pro weighs around 100 grams and measures 10.5cm * 10.5cm * 5cm assembled. The retail price is US$19.99. In June, the company is planning to release a Gami Light portraiture guide book aiming to provide “recipes” for flash photography. Accessories for the Square 43 and Box 21 softboxes, including gel holders and extra diffusers, are coming in July. Gami Light has dealers in the USA, Germany, Sweden, the Netherlands, the UK, Hong Kong and Malaysia. More information may be found on the manufacturer web site. International retailers who ship worldwide include Midwest Photo Exchange and Gadget Infinity.